Bingers, do you already know what you want for Christmas? Do you wanna travel? Do you want a new game for your PS4? Or do you want a new phone? Me? I’m torn between having a Nintendo Switch or a smartphone strong enough to play the Ragnarok Mobile! There is this one brand that caught my eye and I think it might just be the one. Bingers, meet Vivo Y95. I checked the specs of Vivo Y95 and I am impressed. Let’s get to know them more! The Global smartphone brand goes big with Vivo Y95’s 6.22-inch Halo FullView™ Display with its 86% screen-to-body ratio! Forget about the notch because its front-facing camera stands at the top center evoking the image of a rising sun. The feature is part of the brand’s effort to provide an expansive mobile viewing experience. And yes, enjoy your movies and Netflix series in its 1520×720 HD+ resolution! This one is probably one of its best features! 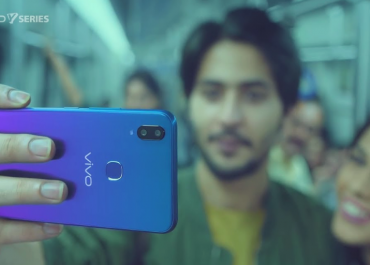 Vivo Y95 has two rear cameras- a 13MP main rear camera and a 2MP secondary rear camera. The double rear camera captures depth-of-field which you can use to effortlessly take bokeh shots! Perfect for photos this holiday! On top of that, its AI technology can identify 140 different photo scenes that will optimize the images that you shoot. If you are into creating your own stickers, you too can do it now with AR technology. Now that’s fun!Vivo Y95‘s camera is made more powerful with the integration of Google Lens technology which allows the recognition of AI images. With this, you can use your phone to identify images taken with Y95! We are the selfie nation for a reason and Vivo Y95 may just be the perfect phone for us! Its 20MP front camera lets you capture detailed and clearer selfies. Its AI technologies such as AI Face Beauty and AI Selfie Lighting detects details such as age and lighting which will render more IG-worthy selfies of you! As a blogger, I cannot leave home to attend events without a powerbank. Power is a necessity to take photos and keep on updating my social media. The Y95 is packing a higher capacity 4030 mAH battery. It promises longer performance that you can trust! To make the most out of it, the phone is complemented by its exclusive smart-energy power management system.Play your games while stuck in traffic or binge on your favorite Netflix series, run multiple apps at ease with the Vivo smartphone’s 4GB RAM and Qualcomm Snapdragon with 439 octa-core processor with a 12nm design. Taking lots of photos and installing games won’t be a problem as you won’t be running out of storage with its 64 GB internal storage. Smartphone gaming is on fire now with the latest releases such as PUBG, Ragnarok, and Fortnite. Vivo Y95‘s strong capabilities allow you to play them seamlessly and undisturbed with its updated AI Game Mode. The all-new Auto Gaming Mode can keep games running in the background while opening other apps. Talk about keeping a winning streak! Y95 gives you a personal assistant in the form of Jovi. The AI can understand every user’s needs. It tracks your steps and calories, provide weather updates, give real-time sports results, and alert you at times. Personally, I can’t wait to experience this on my own!Are you also multitasker, Bingers? I am that is why the Split Screen feature is a need for me! With a simple three-fingered swipe, you can split the screen to two. Whether you want to be updated on Twitter while binge-watching on Netflix, that’s possible and really easy with Vivo Y95! Have you decided to get this one for Christmas yet, Bingers? You should! It’s not just powerful, it is also pretty. It comes in two colors- Starry Black and Aurora Red. Grab a Vivo Y95 now for only P 13,995 from Vivo stores and kiosks nationwide or on Vivo online stores in Lazada and Shopee!